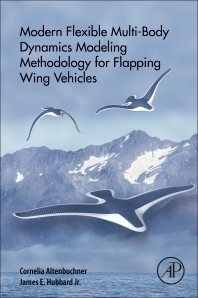 Authors: Cornelia Altenbuchner James Hubbard Jr.
Modern Flexible Multi-Body Dynamics Modeling Methodology for Flapping Wing Vehicles presents research on the implementation of a flexible multi-body dynamic representation of a flapping wing ornithopter that considers aero-elasticity. This effort brings advances in the understanding of flapping wing flight physics and dynamics that ultimately leads to an improvement in the performance of such flight vehicles, thus reaching their high performance potential. In using this model, it is necessary to reduce body accelerations and forces of an ornithopter vehicle, as well as to improve the aerodynamic performance and enhance flight kinematics and forces which are the design optimization objectives. This book is a useful reference for postgraduates in mechanical engineering and related areas, as well as researchers in the field of multibody dynamics. Dr. Cornelia Altenbuchner is currently a Robotics Technologist at the NASA Jet Propulsion Laboratory (JPL) in Pasadena California. Cornelia earned her PhD from the University of Maryland College Park in Aerospace Engineering, during which time she conducted research at the NASA Langley Research Center and the National Institute of Aerospace. She is originally from Austria and her primary contributions are technology development in the areas of flexible multi-body dynamics modeling and simulation, robotic systems, conceptual mission design, as well as dynamics and controls. Prior to joining the NASA Jet Propulsion Laboratory in July 2016 she worked at the NASA Langley Research Center, where her primary projects involved lightweight Robotic Arms and associated systems, parts of which won the NASA Tech Briefs Invention of the year in 2015. Her work there also included the Asteroid Redirect Mission (ARM), Modular Robotic In-Space Assembly and Bio-inspired autonomous flapping wing UAV’s. Her research has been featured by National Geographic and the British Broadcasting Company (BBC). At NASA JPL, she works on robotic systems, which includes dynamic, autonomy and conceptual aspects required to support missions to Europa and Mars 2020. She is a member of the American Institute of Aeronautics and Astronautics (AIAA) Space Robotics and Automation Technical Committee and is an education and outreach enthusiast. Dr. James E. Hubbard, Jr. is currently the Glenn L. Martin Institute Professor at the University of Maryland and resident in Hampton, Virginia. He has an engineering career that is distinguished by more than four decades of scholarship and innovation. He began his career in 1971 as an engineering officer in the U.S. Merchant Marine serving in Vietnam. At the age of 19 qualified for and received an Unlimited Horsepower, steam, and diesel engine Marine Engineering operator’s license from the U.S. Coast Guard and was one the youngest to get such an honor. He was also one of only a handful of African American Marine Engineers in the entire U.S. Merchant fleet. He also holds a B.S., M.S. and Phd. from the at the Massachusetts Institute of Technology and during his time there he distinguished himself by receiving the Goodwin Medal for “Conspicuously Effective Teaching” and The Steward Award for Outstanding Community Service. His scholarship was also recognized as a Scott Foundation Fellow and a Vertical Flight Foundation Fellow. His work in the area of Adaptive Structures has received more than 2500 citations representing an average 100 citations a year for 25 years. He is internationally known and respected as a founding father of the field of Adaptive Structures and his original experiments in this area have become icons of the field and can be found in laboratories, classrooms and corporations around the globe. He has cofounded 3 companies and holds more than 2 dozen patents in the field of Adaptive Structures. He has received the “Key to the City” of his hometown of Danville, Virginia for lifetime achievement. He has also received the Lifetime Achievement Award of the SPIE. He has written several books in the field and more authored than 200 technical publications in his chosen field. He has also been recognized by his African American peers as the 2002 receipt of the Black Engineer of the Year “President’s Award”. His professional affiliations include, Senior Lifetime Member and Fellow of the AIAA, Fellow of the American Society of Mechanical Engineers, and Senior Member of the SPIE. Member of the National Academy of Engineering and the Virginia Academy of Science, Engineering, and Medicine.